Contents: S. Oyama, Ontogeny and the Central Dogma: Do We Need the Concept of Genetic Programming in Order to Have Evolutionary Perspective? 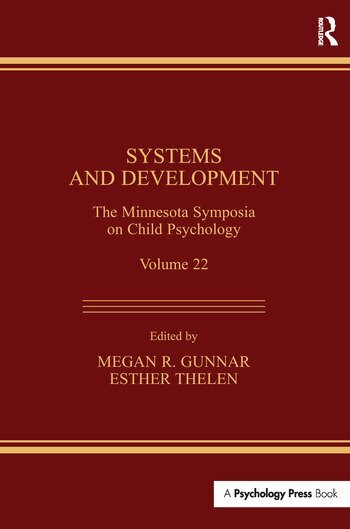 J.C. Fentress, Developmental Roots of Behavioral Order: Systemic Approaches to the Examination of Core Developmental Issues E. Thelen, Self-Organization in Developmental Processes: Can Systems Approaches Work? J. Belsky, M. Rovine, M. Fish, The Developing Family System G.R. Patterson, L. Bank, Some Amplifying Mechanisms for Pathologic Processes in Families F.D. Horowitz, Commentary: Processes and Systems A.J. Sameroff, Commentary: General Systems and the Regulation of Development. "....There is background information, cogent and creative writing, interesting and captivating illustrations, and clarity of expression; the book is an exciting introduction for readers not familiar with the concept of systems thinking." "This volume represents a thought provoking collection of five essays based on original papers presented at the 22nd Minnesota Symposium on Child Psychology, held October 29-31, 1987, at the University of Minnesota, Minneapolis....Horowitz's illustration of language acquisition across different cultures, is a nice case in point."